Customize your Operators in Rainbow Six Siege by equipping them with Elite Skins. 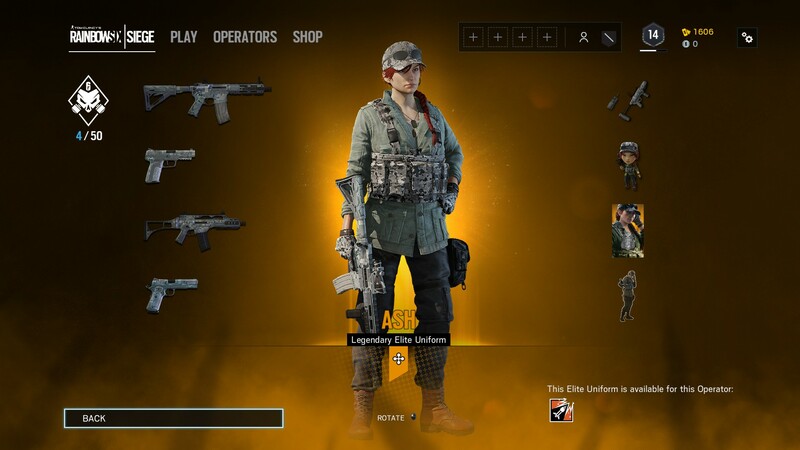 Last year Ubisoft added Alpha Packs to Rainbow Six Siege, and one of the potential rewards are the extremely rare and valuable Elite Skins. With the release of the limited-time event "Outbreak", you have another avenue to collect and equip these Elite Skins. For any newcomers here for the zombie-killing, knowing how to equip Elite Skins can offer its own hurdles. If you’re lucky enough to receive one of the Elite Skin bundles from an Alpha Pack or Outbreak Pack, you can equip it on the operator to show off your sweet new digs. Unfortunately, you can’t just equip everything all at once with a single click, you actually need to do it manually, one-by-one. To equip your Elite Skins, select “Operators” from the top of the main menu and then select the Operator whose Elite Skin you received from your Alpha or Outbreak Pack. 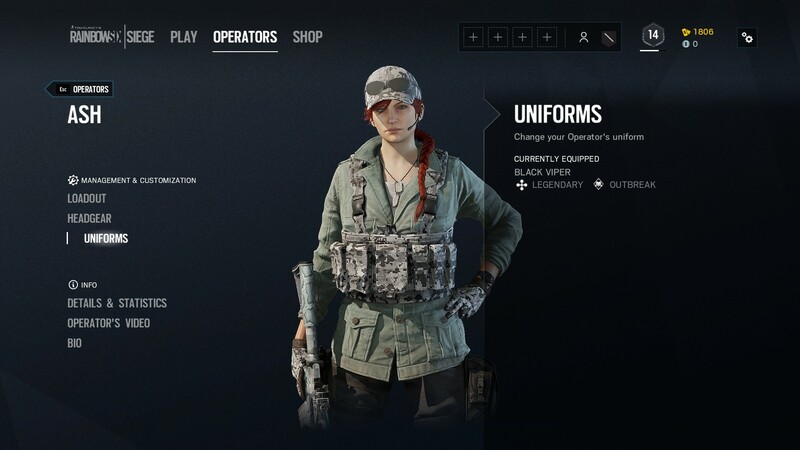 Within this menu you will see your Operator in full, along with three options on the left under “Management & Customization”: Loadout, Headgear, and Uniforms. Selecting Loadout will allow you to customize the weapons and gadgets your Operator is using. Here you can apply any Elite Skins to your weapons as well as any charms you might have received. It’s worth noting that you can use a charm as many times as you like and equip it on as many different weapons as you please. To change the appearance of your Operator and equip Elite Skins, you must use the “Uniform” option. In this menu you will see all of your available skins in Rainbow Six Siege and any items that you could potentially earn or purchase. Most Elite Skins appear as a large box, as they contain numerous Legendary items. Highlight the skin you wish to use, and then, using the appropriate button, choose “Set as Active”. You should see a new dialogue box appear asking to confirm the Elite Skin, confirm the new equipment and you should see your Operator now has the Elite Skin equipped.